Once upon a time, some 50 years ago and earlier, the main connection of Masbate island through its main port of Masbate to the Bicol mainland was the progressive town of Bulan in the southernmost tip of Sorsogon. 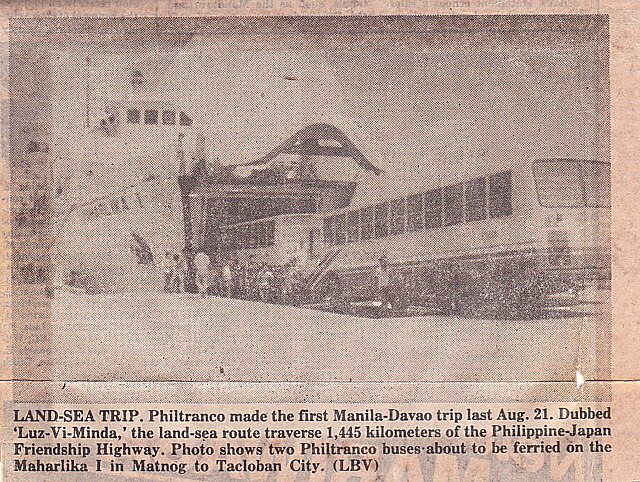 Masbate then had good and links to Manila through passenger-cargo liners. All of those that drop anchor in Masbate port were still proceeding to Sorsogon and the northern ports of Bicol, Samar, Leyte, Cebu and with some still going to northern Mindanao ports. These links had been around right after the war and even before the war. The trade driving it was copra and the port ’round Samar Sea and environs and the northern Bicol ports were great funnels of copra. Copra then was a powerful commodity such that there was even a “Coconut Alliance” in the same manner that there was a “Sugar Alliance” in the Philippine Congress and at the apex of that early on was presidentiable Jose Avelino of Samar which later passed on to Emmanuel Pelaez of Misamis Oriental with Emilio Espinosa of Masbate the local linchpin in the area. These “alliances” were pressure groups and plays a key role in selecting and supporting the national candidates. Masbate port was a hub where goods can be exchanged with other ports in that area. This also involved goods to and from the national capital center and that was one of the reasons of the strong Masbate-Bulan connection. However, at the tail end of the 1970’s these nexus of links where Masbate was a major player began to go downhill. There were plenty of interconnected reasons for that and that will require a long discussion and hence will be left out of this article but two of those were the development of the highways and the rise of the intermodal transport system. In the next phase when Masbate port just became a sideshow in the national liner network, the Masbate-Bulan link just became more of a purveyor of local goods. Masbate will no longer supply goods from Manila since Bulan has already a good road connection to Manila (courtesy of the buses Pantranco South and JB Lines). Motor boats and big motor bancas made the link between the two ports. However, in the same period emerged a new challenger to Bulan which was the port and town of Pilar in Sorsogon and in due time the Pilar-Masbate connection superseded in importance the Bulan-Masbate connection. What tilted the balance was Pilar is much nearer than Bulan to the regional trade center of Legazpi-Daraga and to Manila. The bus factor got into the picture too. Where before JB Line and Pantranco South bus waited for passenger in Bulan terminal right beside the port, slowly “colorum” buses and Pantranco South buses began waiting for passengers in Pilar terminal right beside the port too. Pilar is significantly nearer to Manila than Bulan and so the fare is cheaper and the travel time shorter. Really, when roads get good, some paradigm changes are induced. Through the sea, Pilar and Bulan are nearly equidistant to Masbate port. Big motor bancas and small motor boats connected Pilar and Masbate with the former much more in abundance. Both are powered by surplus truck engines (some are twin V-8s!) but the big motor boat being lighter is nimbler and faster. Another change that tilted the balance for Pilar was the reawakening of the Aroroy gold mines which was started by the small miners. This mine like the Larap mine shuttered in the late 1960’s and early 1970’s due to the drop of the world prices of copper and iron. Now such reawakening fueled people movement and the bus in Pilar and Pilar-Aroroy big motor bancas and small motor boats were there to serve it. Bulan cannot be the port of departure because it is simply too far from Aroroy. And so the start of the 1980’s saw the beginning of the heyday of the Pilar-Masbate big motor bancas. The traffic in the route is heavy both ways in the early morning and approaching mid-afternoon. The reason for latter is these big motor bancas do not run at night and not because of MARINA or Coast Guard edicts. The trips last 3.5 to 4 hours and they hightail it before dusk settles. The reason, as anyone who is familiar with the coastal sea is the winds begin to get active and so do the swells when night is approaching. And the seas here, the Ticao Pass, the Masbate Pass and the Black Rock Pass have a high level of notoriety in showing no mercy to small crafts. These waters are graveyards of many motor bancas especially the fishing bancas. These three bodies of water are considered the most dangerous waters of Bicol, bar none. There are many operators of big motor bancas in the Pilar-Masbate route but two entities dominated, the Denica Lines and the Lobrigo Lines and their rivalry is intense but not destructive. The two then raced with bigger and faster motor boats but their rivalry did not end in that sphere. Lobrigo Lines went into the bus business as vertical integration. So you ride their motor banca and you are assured of a bus seat (that was not sure in the past when there were not so many buses yet). In the reverse route, their bus passenger goes to their motor bancas. Of course all assistance and courtesy is extended and it was not simply like hauling cattle as this route is an epitome of free market competition. So aside from plenty of choices in bus and motor banca, the fares are fair game to haggle and courtesies are on full display. Pilar and Masbate are ports where there is no talk of porterage for motor banca passenger cargo. One does not queue for tickets also. They ask you inside the boat if you are already ready to pay and there is just a minimal charge for cargo. Meanwhile, Denica Lines ventured into passenger ferries first with the cruiser ferry Bikol Express which was the former Elizabeth Lilly of Western Samar Shipping Lines. When they sold that Batanes Multipurpose Cooperative, they then acquire the Odyssey of Alabat Shipping Corporation which is a basic, short-distance ferry-RORO. Later, they also acquired the Vanessa P2 (ex-Torrijos) of Sta. Cruz Shipping which served the Lucena-Marinduque route and they renamed this the Marina Empress. This ship is another basic, short-distance ferry-RORO. Lobrigo Lines took a different approach. They bought two fastcrafts from Japan which became the Maria Natasha and Maria Querubin. Not long after they sold the fastcrafts to Montenegro Shipping Lines Inc. of Batangas which became the point of entry for that company in Bicol waters. The buses of Lobrigo Lines did not last that much long either. After less a decade only a few were still running until operations were nearly shut. It came back but other operators are merely riding on their permits. Maybe being good in seacrafts do not guarantee one will be good in land transport. Montenegro Shipping Lines Inc. whose inferior fastcrafts was trounced in the Batangas-Calapan route then was able to find a profitable haven in Pilar-Masbate. They actually invested in a jetty so their fastcrafts can safely use Pilar port which has notorious shallow waters because it lies in an estuary. They also invested in wharf improvement so they can also operate safely the basic-short distance ferry-ROROs they brought to the route. Then President Gloria Macapagal Arroyo never saw fit to improve Pilar port because that happened to be under the district of a political opponent which was Francis Escudero. She would rather waste money in dozens of “ports to nowhere” than invest in one opposition port which has a true and growing traffic. With the success of the fastcrafts and the basic-short distance ferry ROROs and with it the buses now crossing to and now rolling in Masbate island in its entirely, the Pilar-Masbate big motor bancas felt severe pressure. In most instances now, they are just the carriers of local passengers and cargo since Manila passengers and small cargo is now borne by the buses. Intermodal trucks has also invaded Masbate island and that further lessened the load of the Pilar-Masbate motor bancas. Still the Pilar-Masbate motor bancas are still plying the route bravely and with elan. In the early morning from Masbate they rule the route since the buses and trucks are still not yet around and so the earliest RORO leaves around 10am. In the early morning hours from Masbate their competition are the fastcrafts. But the fare of those are double compared to them and so it is generally the middle and upper classes including the government workers who are patrons of that. The hoi polloi and the early cargo belongs to them because the fastcrafts don’t carry cargo. In Pilar many leave too in the early morning hours especially if the ROROs are gone. The ROROs depart before morning since the buses and trucks are already there and those are early because most will still roll the length of Masbate island and it is their target to finish the route before lunch is well past. In the midmorning there will be no more ROROs in Pilar that will be crossing to Masbate and in Masbate there are no more ROROs after 1 pm. When there are no more ROROs that is the opening for the motor bancas. But it does not mean they will not leave if there are ROROs running. They will and they will try to overtake the RORO since they are faster (what are twin V-8s for anyway?). However, a new development ratcheted up the pressure on the Pilar-Masbate motor bancas. A new route was developed, the Masbate-Pio Duran, Albay route. Pio Duran is nearer to Manila than Pilar and it has deeper waters and so there are no low tide restrictions. This route further took away traffic from the Pilar-Masbate motor bancas and since they are not running that route they cannot compete directly. The Pilar-Masbate motor banca is not laying over and die. They are fighting hard especially on local cargo and passengers. They really try to lasso passengers and cargo. They will even take in cargo even without accompanying passengers and deliver it within the town through tricycles. They will treat the passengers well. Well they have to since they are no longer as full as before. There is no more way to take back the bus passengers although the knowing and especially those just from Masbate City or nearby know they can still take the motor banca which is cheap and they can haggle with the fare in the buses waiting in Pilar. Or be even to leave earlier if they will choose to proceed to Legazpi which has day morning bus trips which are faster (the buses from Pilar will still look for passengers along the way). But still it is clear that the heyday of the Pilar-Masbate motor bancas is now over and it is already an uphill fight for them. I just hope it does not degenerate to a struggle for survival.